﻿﻿Churches and public radio are some of the only places you heard the word "pledge" these days. And "stewardship"? What's that? ​As followers of Jesus, we've noticed that there is whole lotta talk about money in the Bible. We feel compelled to take seriously God's call to act as stewards of the resources we have. Stewardship is all about the ways we - as individuals, and as a faith community - use our money, our skills, and our time to be the hands and feet of Christ in our community and our world. Members of First Congregational are expected to support our shared work together with their prayers, presence, gifts, and service. Part of this support is financial and most of our members make a commitment each year to pledge a certain amount. 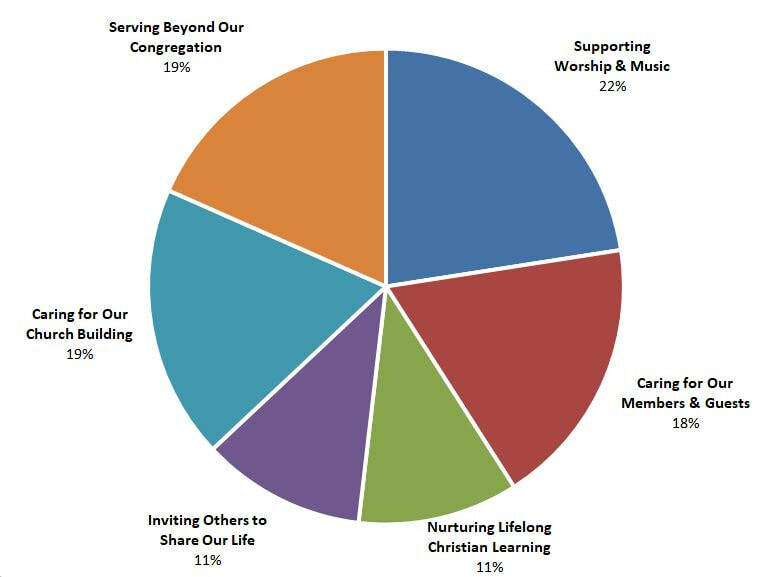 That pledge helps our church leaders create an annual budget. This process of pondering our pledges and being encouraged to pray and carefully consider what we can each contribute typically happens in the fall each year and we call it the Stewardship Campaign. We've put together a set of FAQs about Giving to help you understand more about this process. Contributions can now be securely debited automatically from your checking or savings account. Our new electronic giving program through Vanco provides convenience for you and much-needed donation consistency for our congregation. Collection basket offerings can fluctuate significantly from week to week due to travel, illness and other circumstances, but when contributions are automated, the church receives funds on a steady, uninterrupted basis. To set up your electronic donation, please download and complete the paper authorization form and return it to the church office. Printed copies are also available at the Giving Station located at the back of the Sanctuary. Did you forget your checkbook or cash? No problem. We accept credit and debit cards on Sunday mornings or during the week. Just stop by the Giving Station located at the back of the Sanctuary anytime on Sunday morning. There is a smartphone equipped with a Square Reader and easy-to-follow instructions. Just select the dollar amount for your gift, swipe your card, and receive your receipt via text or e-mail. Please note that these electronic options do incur some fees for the church ($0.25 each time we make a debit through Vanco, a 2.75% fee of anything given via Square, and a 2.9% fee of anything given via PayPal). If you are able to slightly increase your contribution to cover the fees, that's wonderful. Another option for regular electronic giving that may be available to you at no cost is having your bank set up regular electronic transfers to the church via an online bill pay system. Please check with your bank for details. If you shop at Dillons, you can link your shopper's card to our church and Dillons will donate funds to First Congregational. Visit the Dillons website and link your card to our congregation (Organization #10145) to get started. You can also raise money for First Congregational each time you shop at Amazon. Visit this link to set your preferences. After that, make sure you always begin at smile.amazon.com and the church will receive 0.5% of your purchase.